You are in a fight for your life with an inmate. He has you pinned against the wall and he is punching you and slamming your head into the wall. You fall to the ground, and as he mounts you he wraps his hands around your neck and starts to squeeze. Your movements become restricted and you experience blurry vision, a slight headache, shortness of breath, tingling sensation to your legs, shoulders, knees, arms and finger tips. You realize you have a brief short moment of opportunity to do something. What do you do? 1. Blood Choke — Pressure is |placed on |the cardiac and the blood flow is slowed down, which affects the amount of oxygen transported to the brain. When the level of oxygen needed for brain support is reduced to a lower level the subject goes unconscious. a. The Rear Choke is an example of a blood choke. The inmate positions themselves directly behind the officer and wraps one of the arms with the forearm going around the front of the throat of the officer, and then secured with the second hand. a. Front Hand Chokes — the inmate places their hand around the front of the officer throat and squeezes. b. 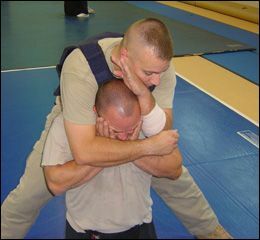 Bar Arm Choke — the inmate uses their forearm or elbow to apply pressure directly to the front of the throat area. c. Smothering — the inmate uses either a pillow or soft materials or their body to place over the officer's face. d. Strangulation — Parts of the officer’s clothing is twisted around the officer's neck. • Remain calm. Panicking will not help you get out of this, and time is of the essence. • Protect the airway. You need to release the grip from around your neck. If possible you can do what is called the “Turtle Shell Technique,” this is what you tuck you chin down and raise your shoulders up to help support your neck. • Stay focused on your objective. Chokes can be reapplied, so escape quickly and evaluate your force options. • Survey the areas for possible weapons you can use or that they may have access to. • If all else fails you can always try playing possum and collapsing to go motionless and limp giving the inmate the impression he succeeded. 1. Biting whatever is in front of our mouth. 2. Your fingers into the inmates eyes. 3. Head butting with the back of your head. 4. Slamming their body into a wall or other hard objects like door knobs, pay phones, rails to stairs etc..
5. Break anything within reach. This includes fingers, ankles, knees, legs or toes. 6. Sticking your pen or other hard object into the inmates eyes or throat area. 7. Changing your environment if you are standing and nothing is working try going to the ground and using it as an impact weapon, or down the stair case. In my last 25 years studying, researching, practicing and teach various forms of officer survival tactics I have learn one important thing. "If you don’t train today for your opponent today you may be giving them a shot at the title tomorrow!" Stay safe, stay strong and most importantly: Stay Alive! Dave Young is the Founder and Director of ARMA, now part of the PoliceOne Training Network. He is also the Chairman of PoliceOne.com Advisory Board, and a training advisor for CorrectionsOne.com. Dave graduated from his first law enforcement academy in 1985, and now has over 25 years of combined civilian and military law enforcement and training experience. He was a sworn corrections and law enforcement officer in the state of Florida and has served as a gate sentry, patrol officer, watch commander, investigator, Special Reaction Team (SRT) member, leader and commander in the United States Marine Corps. Dave has participated in and trained both military and law enforcement personnel in crowd management operations throughout the world. Dave is recognized as one of the nation's leading defensive tactics instructors specializing in crowd management, chemical and specialty impact munitions, protocol and selection of gear and munitions, ground defense tactics, and water - based defensive tactics. He has hosted television shows for National Geographic TV Channel on Non Lethal Weapons and the host of Crash Test Human series. He is a former staff noncommissioned officer in the United States Marine Corps, a member of the Police Magazine advisory board, and a technical advisory board member for Force Science Research Center. Dave is an active member of the American Society for Law Enforcement Training (ASLET), International Law Enforcement Educators and Trainers Association (ILEETA).